The Aloe Vera plant that heals almost everything The Bible and the philosopher Aristotle already spoke of this wonderful plant. Cleopatra and Queen Nefertiti would use its healing and curative powers. Fuerteventura is considered the world capital of this plant. A hardy plant, Aloe Vera needs little water and plenty of light, which makes Fuerteventura an ideal place to grow Aloe Vera Barbadensis, and over recent years the plant is becoming as important a crop to the island’s economy as the tomato – especially now that natural medicine is becoming more popular and often more effective. Indeed, recently the Canary Island’s Government have announced financial aid of up to 50% to encourage the cultivation of the plant on Fuerteventura. Currently the main Aloe Vera plantations are in Tiscamanita and Valles de Ortega – between Antigua and Pájara. Descending from the perfect crater rim of Gairía volcano and traversing the rough fields of Malpaís Chico, we emerge onto a ridge. To our right lie the scattered white, single storey houses of the hamlet of Tiscamanita and to our left, the bruised mountains of Montaña de la Goma, Morro de los Halcones and Agudo brood. Ahead of us, emblazoned on our retinas in the intense midday sun, is the beautiful and mesmerizing sight of hundreds of thousands of Lily of the Desert plants in full bloom. 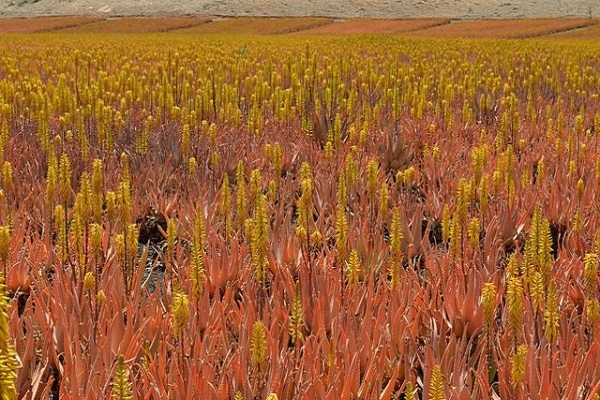 These are the interminable fields of Barbadensis Miller Aloe Vera plants which fill the horizon, their slender yellow flower spikes rippling in the breeze atop a red sea of razor-sharp, bulbous tentacles. Better suited to Fuerteventura’s arid and sun drenched climate than almost anywhere else on the planet, the clear gel from the leaves provides the island’s liquid gold, containing a powerful amalgam of vitamins, enzymes, minerals and essential oils which have gained the little lily its many nomenclatures. The Ancient Egyptians knew Aloe Vera as ‘the plant of immortality’, using it to preserve their beauty; Hindus knew it as ‘the silent healer’; and when Christopher Columbus set sail to adventure beyond the edge of the known world, or El Hierro as it’s better known today, he stocked up his ships with supplies of Aloe Vera which he called ‘doctor in a pot’, knowing it would protect his sailors from the ravages of scurvy. Grown ‘cresco secco’ on Fuerteventura which means with plenty of sunlight and very little water in order to produce the highest concentration of minerals in the leaves, the plants are allowed to grow slowly and don’t begin to store the precious gel until they are three years old. The older the leaves, the greater the concentration of gel. For this reason, only a few, four year old leaves are picked from each plant annually, leaving the rest of the plant to continue to mature. Rapidly growing more important in terms of the island’s GDP so that now its importance to the economy is on a par with that of tomatoes, Fuerteventura’s Aloe Vera is considered some of the best quality in the world and you can visit Aloe Vera farms on the island to find out more about its extraordinary health and beauty properties and to buy products at source. You’ll also find Aloe Vera products for sale all over the island. ALOE VERA BARBADENSIS looks like a small agave plant, and when adult grows to about 60-70 cm. Small plants often have white marks on the leaf which disappear as the plant grows. When the plant is about 2 or 3 years old a leaf grows in springtime which then stems off into one or two smaller branches which produce yellow flowers. 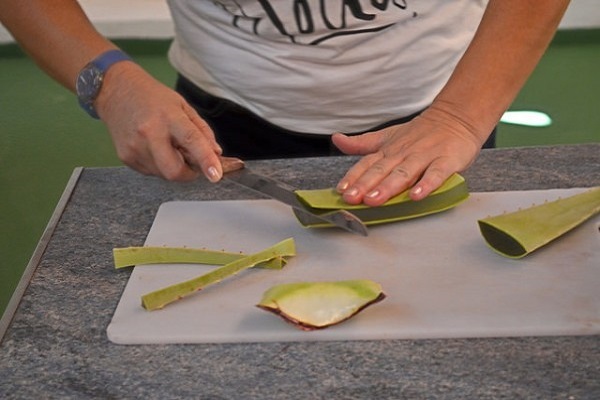 Research into the Aloe Vera gel continues and some element of mystery remains, although most research agrees that Aloe Vera is particularly effective in the treatment of burns, cuts, grazes, bruises, allergic reactions and dermatological conditions. This is due in part to the fact that the Aloe Vera gel acts as a natural anti-histamine and contains an aspirin like compound called Salicylic Acid. Aloe Vera also speeds up the healing process (some studies show healing is increased to eight times the normal rate), which is attributed to the fact that Aloe Vera gel provides 20 of the 22 amino acids required by humans, including 7 of the 8 essential ones which are not produced by the body itself. Aloe Vera gel contains Vitamins A,C,E (antioxidants), B12, Choline and Folic Acid, all in a completely natural form, plus 9 minerals including Iron, Zinc, Magnesium, Sodium and Potassium. The cosmetic industry is well aware of the healing properties of the Aloe Vera gel, and with its antioxidants and increased cell-regenerating properties it is reputed to be an effective anti-ageing aid and is often an important ingredient in cosmetic products.